It makes such a wonderful day today and four of your favourite Disney Princesses: Elsa, Rapunzel, Pocahontas and Sleeping Beauty have decided to spend it in style - they are going to rent a tandem bicycle and ride thought the great fantasy land! Elsa was chosen to drive the funky bike but the fun cannot begin before the girls get their outfits perfectly mixed and matched and accessorised. Would you like to help them out? 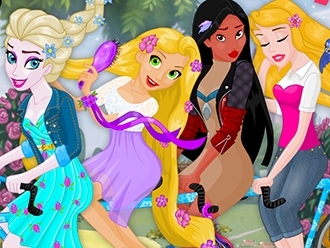 Come and join your favourite princesses in getting this brand new Disney Dress Up Game for girls started and see what lovely casual-chic outfits you can create for each of them! Begin by dressing up Frozen Elsa: there are some super cute tank-tops and colourful leggings available in her wardrobe as well as girly-girl dresses and some super cute accessories, so feel free to take a closer look and select your favourites. Next in line is Rapunzel! 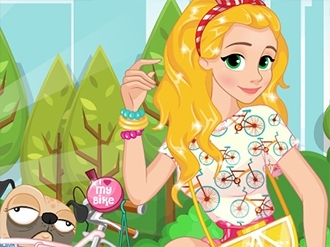 In our new dress up game we have prepared some super feminine clothing pieces for the long haired Disney Princess: there are puffed sleeves, lace dresses are available in sweet pastel colors, her skirts are loose and covered in playful prints - what are you going to pick for her? In Pocahontas’ wardrobe you will find a wide variety of prints, most of her clothes being covered in tribal or aztec patterns, denim and fringed ponchos as well as an impressive collection of leather boots. Choose a romantic dress to dress up Sleeping Beauty with and some lovely accessories for a complete look.